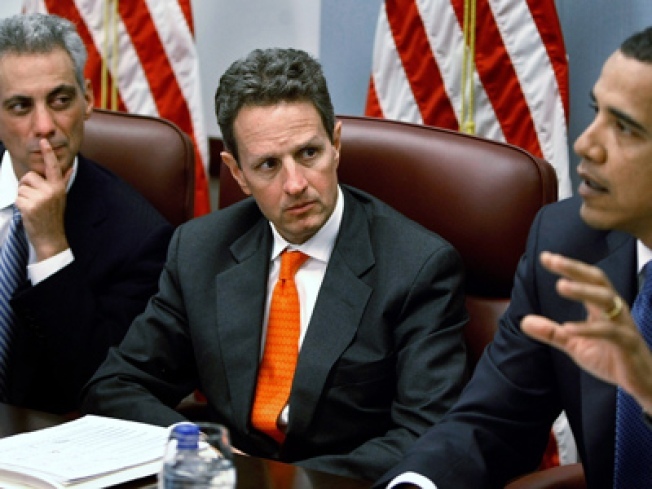 Tax troubles might not be enough to end Keith Geithner's nomination to a Secretary post. Rush Limbaugh is fulminating. The New York Times editorial page is indignant. All the ingredients of a political firestorm are in place. And yet, the Timothy Geithner controversy seems to be fizzling. It’s not that the usual voices are silent. But faced with a made-to-order personal financial scandal, there’s been only a half-hearted response in the political echo chamber, and the consensus among Washington and media elites seems to be that the economic moment is too serious to be distracted by Geithner’s tax problems. It’s easy to imagine how things could have turned out differently. Bill Clinton saw two nominees for attorney general go down when the public responded with fury to revelations that they’d hired illegal nannies. George W. Bush lost a cabinet nominee in the same way. And in 2006 members of Congress found themselves on the wrong end of totally unexpected outrage over a deal to lease American ports to a foreign company, Dubai Ports World. In many or most of these cases, media commentators and even members of Congress initially reacted with shrugs. Only later, after public anger flared, did Washington join the frenzy. To date, only a few major voices have spoken out to criticize Geithner. And if there’s a reserve of populist resentment over his appointment, it hasn’t yet erupted into the national media, as in previous nomination controversies. In the hours after the disclosure that Geithner had paid more than $48,000 in back taxes and interest, only a handful of his critics on either the right or the left tried to take a swing at the nominee. Conservative blogs, and liberal websites that have complained about Geithner’s nomination, remained virtually silent about his tax issues. “Obama has thoroughly reviewed Treasury Secretary-select Tim Geithner’s situation and given it his blessing. Everything’s okay!” Limbaugh cracked. The chorus of Geithner-critics got a few more members Thursday, suggesting the controversy may not have played itself out just yet. Still, the great majority of commentators – and, to all outward appearances, the majority of lawmakers who actually have to vote on Geithner’s nomination – seem convinced that the New York Fed president is still fit to run Treasury. And for whatever reason, voters don’t seem any more interested in Geithner’s problems than they were two days ago. There are scarcely any traces of a more intense public anger starting to burn. Jake Siewert, who served as White House press secretary in the Clinton administration, said that the current financial crisis was likely overshadowing the tax issue in Americans’ minds. Chavez agreed, adding that some Obama critics might be reluctant to challenge a nominee who is generally viewed as a moderate, middle-of-the-road pick.